Last week at Pinay Mommies Community, we had our 12th Weekly Fest with the theme “Wackiest Photo with Hubby or the Kids.” Well, my entry won second place!And today, my prize arrived! Check out the bracelet below. To view the winning entry, click HERE. By the way, I would like to thank Mommy Aeirin for being our benefactor for the 12th Weekly Fest. Thanks, Mommy A!! Muah!! 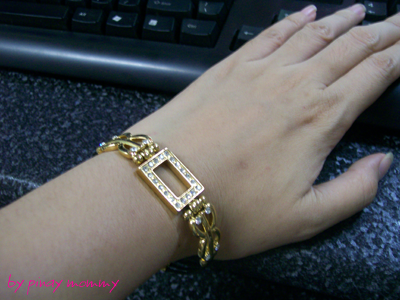 mommy, bagay sa maganda mong hand…. wow mommy, i forgot to mention… ang ganda nyan! congrats! Wow! Such a poshy prize. Indeed it suits you very good. Congratulations then. As I see from the comments, you win many contests. I think you have really the luck and the talent there! Brava! What beautiful hands you got in there. I think you won because the winning prize does suit you good. wow!! so nice ! !congrats for winning! very nice! you’re collecting bracelets lately!